➡️ Able to start immediately ➡️ Crowed as at shopping mall ➡️ Fully equipment ➡️ Can apply Work Permit for Malaysian or Dependent Pass holder, also can apply Loc FOR LTVP/ LTVP+ Holder Currently have 2 staffs Please feel free to contact via sms if you are interested. Thanks. 1) Fully Fitted Kitchen - with all kitchen appliances & equipment. - License ready can start on the spot !!!! - Big Space Food Stall able to fit in 4 to 6 employee. 2) Great amenity and traffic crowd 3) 1Min MRT walk way 4) Air - Con environment 5) Monday to Friday working crowd - Morning and Lunch crowd. ➡️ Able to start immediately ➡️ Crowed as at shopping mall ➡️ Fully equipment ➡️ Can apply Work Permit for Malaysian and LOC FOR LTVP Holder Now have 2 staffs Call for more details! Clementi Stall Takeover, Zero Fees! 100G pasir panjang road , 01-03/04 , interlocal Building. 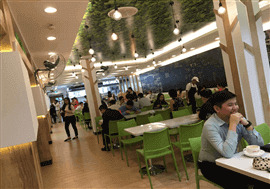 Food Stall For Rent In 190, Woodlands Bizhub, High Lunch Human Traffic, Cheap Rental $1500. Stall available from 16 Jul onward, kindly contact for detail. ➡️ Able to start immediately ➡️ Ready crowds from surrounding industrial offices ➡️ Low rental Now have 2 staffs Call for more details! Salad stall in air-conditioned food court ( jurong area ) , spacious, good crowd , surrounded by office buildings . pls call kristy ( after 2pm ) to enquire @ 91455591 . Famous soup stall in Marina area seeking sincere buyer to takeover. Newly renovated in Marina One. Interested parties kindly SMS/WHASTSAPP 94556506 for more details.